I am very grateful to Katie Bradburn, Headline and Bookbridgr for a copy of Kathryn Hughes’ ‘The Letter’ in return for an honest review. It was published on 8th October 2015. Tina Craig is in an abusive marriage and when she finally finds the courage to walk out, her life is changed by a letter she finds in an old suit handed in to the charity shop where she volunteers. 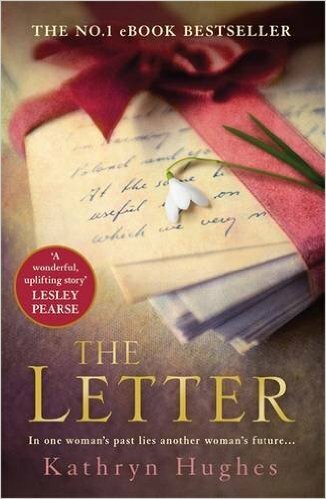 It’s difficult to say more about the plot of ‘The Letter’ without spoiling the read for others, but I enjoyed the way it traveled between the 1970s and the Second World War with the prologue and epilogue giving a satisfying cohesion to the novel. I don’t always like books with different times but l appreciated the skill with which the different time frames were blended throughout. Kathryn Hughes pays such attention to details that it is easy to place yourself with the characters in their settings and eras. I also really liked the characters and the realism of their experiences, even though I found the direct speech a little stilted at times. I thought the characters developed well as they are gradually revealed to the reader. Whilst this is, ultimately, a love story, there are larger themes at work too, with adoption, illegitimacy, abusive marriages and loyalty all explored beautifully. Tina’s self-delusion about Rick’s behaviour is sensitively portrayed so that, although I was as frustrated by her responses as are Linda and Graham, I could fully understand her actions. Similarly, the reactions of Chrissie’s parents and the church are totally evocative and convincing. If there is a flaw to the book, I think it is that there are too many coincidences and I would have left out the final scene in the charity shop. That said, I thoroughly enjoyed ‘The Letter’. I thought it was emotional, interesting and a cracking read and I’d highly recommend it all readers.